Goal Line Technology? It’s A No From Me! My thoughts on Goal Line Technology. Warning: may contain rants! 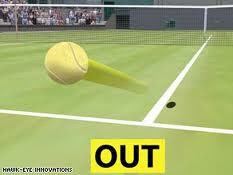 So, FIFA has finally caved in and given the green light to goal line technology. There are two systems competing for the “honour” of being used once every three months – Hawkeye and GoalRef. The former we all know about, as it is already used in cricket and tennis. GoalRef, meanwhile, is a new technology which uses sensors just behind the goal line and in the ball to determine whether or not the ball has crossed the line. This information is then beamed to a special wristwatch worn by the match referee, both as a visual medium, and also with a vibration. Now, my arguments against GLT are manifold, but one of the main ones does seem to be addressed by GoalRef. 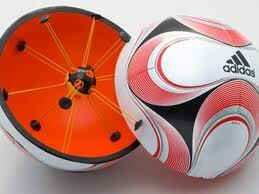 Supporters of GLT have always argued that we should have technology in football as they have it in these other sports. Now, my argument here has always been thus: cricket and tennis are stop/start sports, and whenever a line decision has to be made, the ball is always dead – a wicket, or an out decision in tennis. In football, the ball very rarely goes out of play after a goal line incident. Therefore, to implement a system like Hawkeye or a video based technology, you would have to artificially stop the game in order to reach an outcome. Reading about GoalRef, it would seem that the decision can be made organically, without disrupting the game, thus avoiding twenty players chasing the ref arguing their case, or breaking up play for a frivolent appeal. All this sounds great, doesn’t it? Well, not quite. For a start, there is no guarantee that FIFA and the International Football Association Board (IFAB) will opt for GoalRef as their preferred option. Indeed, the success of Hawkeye in other sports might win them the vote, and my ire would really be up then! Thankfully, video technology seems to have been discarded as an option. Imagine if that had been brought in! That would have been a slippery slope to a place where video evidence is used for every aspect of the game. No matter how many times you protest and say that it would only be used for goal line decisions, it would eventually spread through the game. Just imagine that the referee allows a goal after video evidence shows the ball crossed the line. However, in the replay, the video also shows the striker was offside in the buildup. It would only be a matter of time before every little decision was called into the video evidence spotlight. As I say, thankfully it looks like this situation will now never arise. So, this leads us onto another huge stumbling block; the implementation of the technology. As a non-league fan, I am hugely sceptical about the whole thing. The technology could cost anywhere up to a quarter of a million pounds. Who pays for that? And how far down the ladder does it get implemented? FIFA have always said they wanted the game to be the same from the World Cup Final down to local non-league and park games. Any form of technology immediately destroys that ideal. Now, I have played parks football before, and most of the time we didn’t have assistant referees, and on the odd occasion not even a referee! But the game is still the same; twenty two players kicking a ball about and debating every decision. It’s been like this since time began, and I like it like that! So, back to the cost. There is not a non-league club that could afford that huge outlay, and there wouldn’t be many clubs outside the top two divisions that could. I’m sure there would be grants available, but the outlay would still be huge for most clubs. And how would its installation be enforced? Either you install it or you cannot be registered with the league? That would suggest that it can only be implemented in the top flight in this country (I won’t be using the name of the league, as it makes my blood boil just thinking about them), because they are run independently from the Football League. It couldn’t be introduced into the Championship, because then surely it would have to be brought down into Leagues 1&2, and as already been discussed, that would be way out of the reach of most of those clubs. If it does only get introduced into the top flight, or even the top two divisions, then that unbalances the game, surely? Let’s say, for example, that Leyton Orient get drawn against <random top flight club>, and the first tie is at Brisbane Road. Orient are winning, but are then pegged back by a shot that is deemed to have crossed the line, but there is no technology. Replays subsequently show that the ball didn’t cross the line, and Orient are denied one of the biggest results in their history. In the replay, there would be technology involved. How is that fair? It makes a mockery of FIFA(don’t get me started on them) and their desire to keep the game the same at every level. Speaking of unbalancing the game, it makes the FA look hypocritical to say the least. Currently, they don’t allow artificial pitches to be used in their competitions (although there has been movement on that issue recently), yet they are going to be quite happy to have effectively a two-tier system, with some clubs having technology and some not. It is a joke, and should not be allowed. I am an old school fan, one who likes the post match debate over the game, and that includes dodgy decisions. Technology will just sanitise the game, and I would put money on people pining for the “good old days” in a few years’ time. If, IF I had to pick one of these two systems, I would opt for GoalRef. That doesn’t mean I condone it, or endorse it in any way whatsoever. It just means that it is the lesser of two evils. Hawkeye is too close a relation to video technology, and would require a change in the flow of the game, namely a referral/challenge type system, which would patently not work in football. At least GoalRef would allow the game to flow if the ball didn’t cross the line. And at least it can only be used for deciding if it was a goal or not. It cannot be used for any other decision on the pitch, whereas Hawkeye could be; corners, throw-ins, offsides to name a few. I am wholly opposed to technology sullying our game in this way, and it will only serve to spur me on deeper into the world of non-league football! What do you think? Are you an advocate of technology, or a stick in the mud like me? Get in touch and let me know your opinions. Posted on July 20, 2012, in UTL Archive and tagged Goal Line Technology, GoalRef, Hawkeye. Bookmark the permalink. Leave a comment.